Lighting is one of the very important things in house design and construction. In Feng Shui, it is believed that adequate lighting is auspicious in the house. Whether the house have natural lighting or electrical lighting, it should have the right amount of lighting. Modern house design comes also with modern contemporary lighting. It is a great adaptation in house living nowadays to promote better lighting with good designs. Proper lighting should not only be found inside the house but it should also be found at contemporary outdoor lighting. 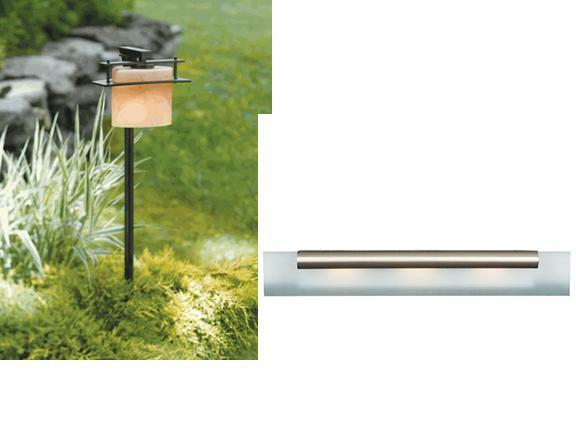 The photo in the left above is a Hubbardton Forge Outdoor bollard with glass options. This is an excellent lighting in the garden that gives a beautiful and contemporary lighting at night. This fixture is hand-made in Vermont. Hand-made fixture are said to be the best in quality and durability. The Hubbardton Forge Outdoor bollard outdoor lighting has an option that you can choose for the bulb type if Incandescent or Fluorescent (Energy Efficient). The photo in the right is a modern bathroom lighting. It is a Roto Contemporary Wall Sconce and Vanity from Access Lighting in Brushed Nickel, Pewter. It is very neat and orderly when this is the lighting used in the vanity bathroom. Normally this can be seen in hotels and fine restaurants. This entry was posted in Shopping and tagged contemporary outdoor lighting, modern bathroom lighting, Modern contemporary outdoor and bathroom lighting, shopping for lighting. Bookmark the permalink. I agree that lighting can change your life! Contemporary or traditional… in the end it is just a taste but thanks to new innovations in the light sources (LED, OLED) especially modern lamps now come in the most stunning designs possible. It is going to be an exciting future in lighting.